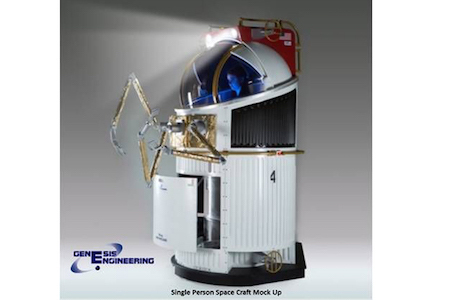 Genesis Engineering Solutions (GES) in Lanham, Maryland has sponsored an engineering design contest to develop a Single-Person Spacecraft (SPS) concept. GES's Single-Person Spaceship contest involved students from engineering, industrial design, human factors, and space architecture. They were encouraged to develop creative internal designs using only existing technologies. Furthermore, they had to provide controls for flying the SPS and operating robotic arms all while floating in zero-gravity. The interior had to include displays and controls, warning lights and alarms, pilot restraints, creature comforts, and other accoutrements one might find in an automobile here on Earth. "It's a small room," Ordaz said, "but not too small. Millions of people live this way. In any case, a Belter would hardly be a claustrophobe." "No. Owen flew a singleship before he joined us. Three months at a stretch in a cabin so small, you couldn't stand up with the air lock closed..."